Lifetimes 48 inch acrylic backboard features a pro-glass look and provides superior performance. The steel frame gives added rigidity for improved rebound. The graphics are screen printed with ultraviolet protected inks offering fade resistant color. 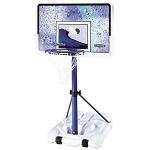 The frame pad gives a professional appearance to the Acrylic Lifetime Basketball Backboard. Play like the pros with the high-performance Slam-It Pro Rim. 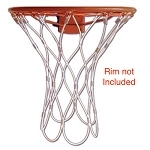 This rim features an arena-style wraparound brace, supporting a 5/8 inch ring of solid steel. Welded-steel net hooks do not require replacement. Double-compression springs provide excellent spring-back action. Goals and Backboards are built for aggressive play. 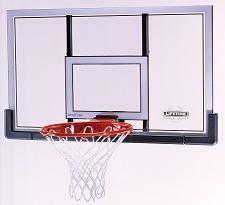 Lifetime Outdoor Basketball Goals and Back boards are compatible with the mounting brackets model9594 and1044.